When I got back to Philly, one of the first things I did was get my hair cut. It was luxurious to finally be able to do that. Afterwards, we wanted to eat and drove around and around looking for something. Traffic was horrible that night, I felt like I was driving around for at least an hour. We wanted to go to this italian byob in old city, but even though we got there early, they said they were booked for the entire night. Boo! So after walking around some more, we finally just decided to get food at Dolce. It’s in old city too, next to Paradigm. I think they are sister restaurants, as there’s a hallway between the two that connects them. Anyhoo, we ate at Dolce, which is italian. It was right after restaurant week, but some restaurants had decided to continue the restaurant week menu. Dolce was one of them. So one of us did end up getting a restaurant week menu option. 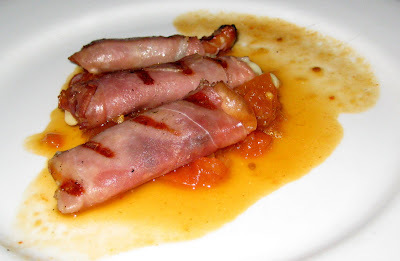 The appetizer was smoked mozzarella wrapped with prosciutto with a cherry chutney. I think these creeped me out, because they looked like fingers. As for the taste, they were kinda weird. The ham was sliced so thick that it was pretty much overpowering anything else, like the cheese. And the chutney was too sweet. Not the greatest appetizer I’ve tasted. R got the gnocchi duo. Half in a red sauce, half in a pesto sauce. We both agreed that the red sauced ones were better. 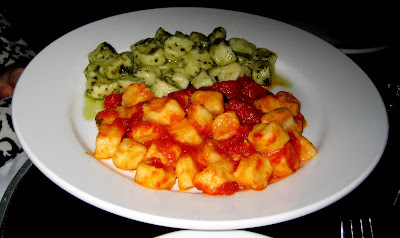 The pesto was bland and it seemed that in general, the gnocchi had been overcooked. 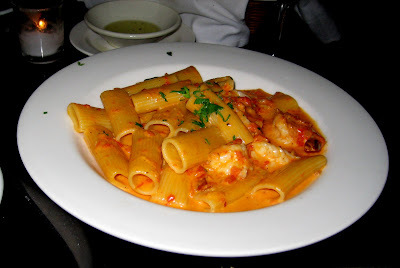 I had rigatoni with shrimp in vodka sauce. This was quite good. The sauce was strong, but in a good way. I didn’t even end up eating all the shrimp. Strangely, I didn’t feel they were really necessary. It would have been fine as just a big plate of pasta. The dessert that came with the restaurant week menu was a trio. It had tiramisu, cannoli, and bread pudding. R liked the cannoli a lot. I’m not into tiramisu, but she thought it was ok. 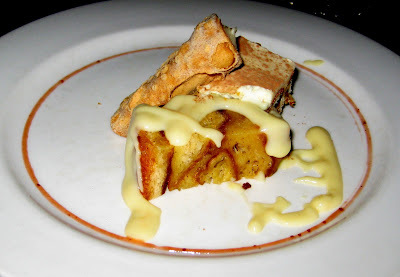 I liked the bread pudding the best, which is made from croissants. Yum! This place is dark. Too dark. You can’t read the menu. The floor is all lit up, like a night club. It’s bizarre decor for a restaurant. I think they’re trying to be romantic, but it ends up more cheesy. Service was ok though, no complaints there. I probably won’t be going back though. I think there are probably much better italian options elsewhere in Philadelphia. Certainly more homey.